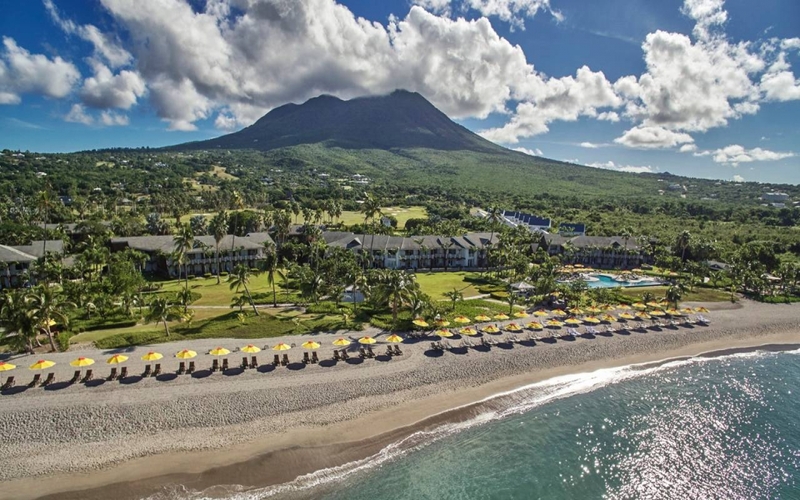 Nevis is 36 square miles (93 square kilometers) of tranquil and untouched Caribbean, with no large cruise-ship ports, no traffic lights, no fast-food restaurants, no building taller than a coconut tree and a rich history that can be seen throughout the island. This secluded, beachfront Resort is just minutes from the cultural hub of downtown Charlestown, adventures on both land and sea, as well as steps from local hot spots and historic sugar-mill ruins. You have a choice to play golf alongside the Green Vervet monkeys, dive into the sea to explore the nearby reefs, reconnect with nature at the serene Spa, or create a romantic evening in the colorful sunset while you dine on the water’s edge.